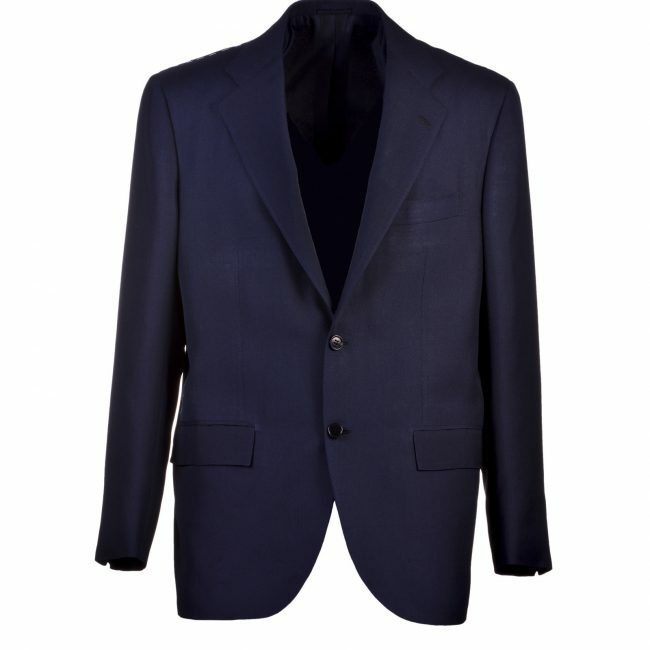 The navy blue suit is the new black, and this is thanks to its impressive versatility. 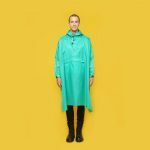 It is the kind of outfit that you can wear in summer or winter and also rock it as casual wear or for your formal look. 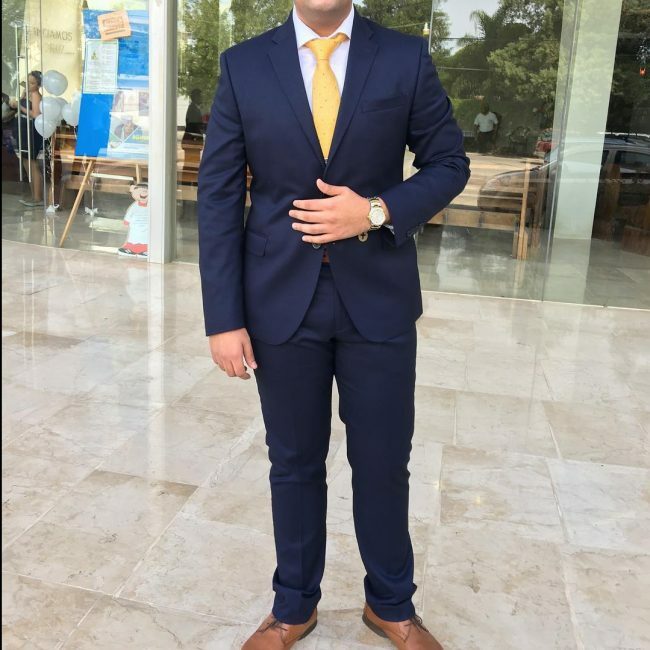 Since the color is already perfect, you only need to find a suit design that works well for your particular needs and also pair it with a nice shirt, tie, and some classy shoes. But, all this should not be a problem because the options are endless. 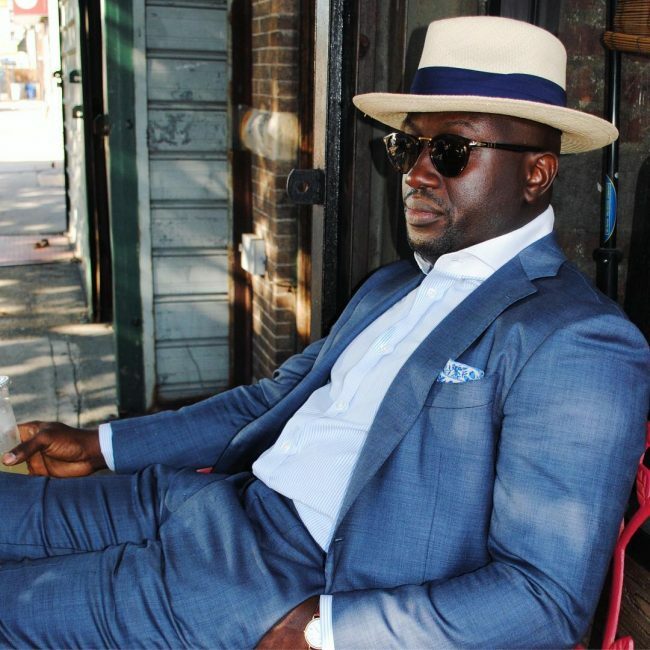 Here are some 45 exciting ideas on how to rock your navy blue suit. 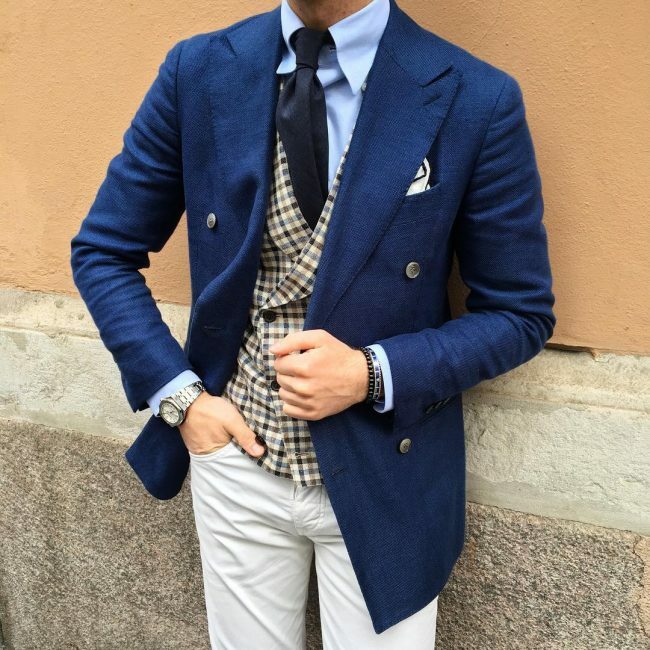 This look is for a man that wants to maintain a decent look but does not wish to appear too formal. 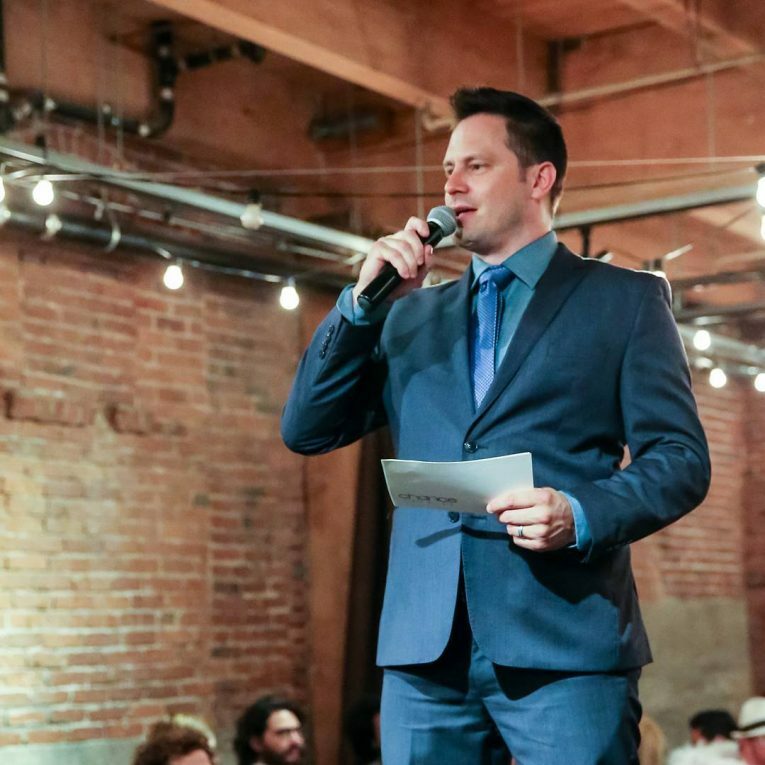 It involves wearing a two button slim fit suit that you should pair with a white shirt, patterned tie, brown pocket square and casual loafers (without socks). 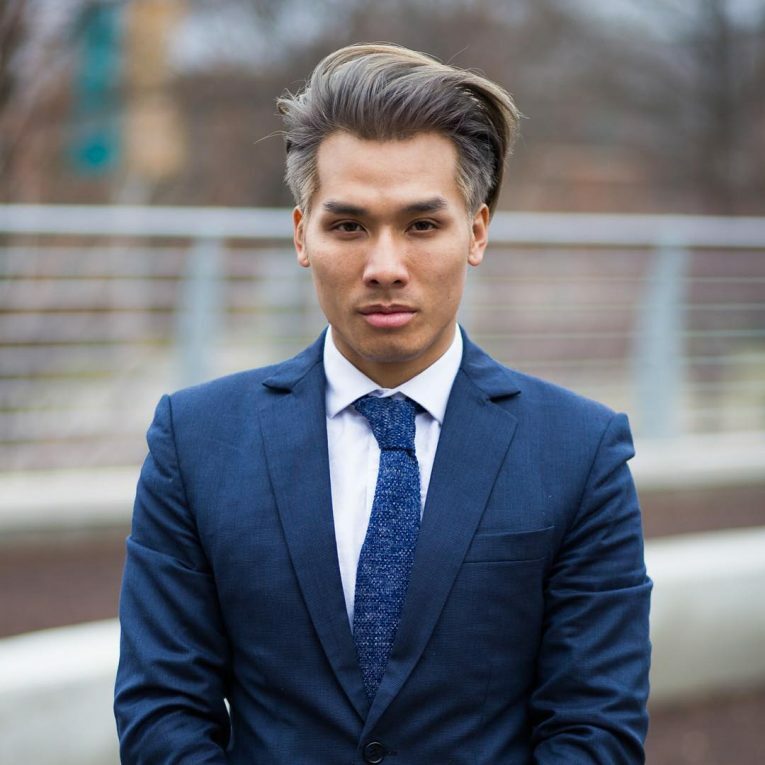 Minor elements such as the color of your tie can make a huge difference in your overall appearance. 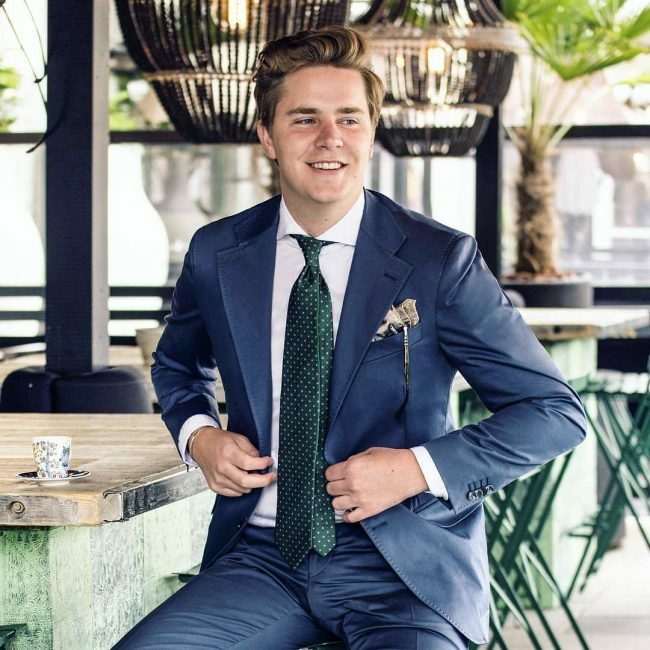 This two-button slim fitting suit has a simple formal design that also entails having a cute square pocket, but the choice of a green tie adds a unique look as it helps to break the monotony of the navy color. 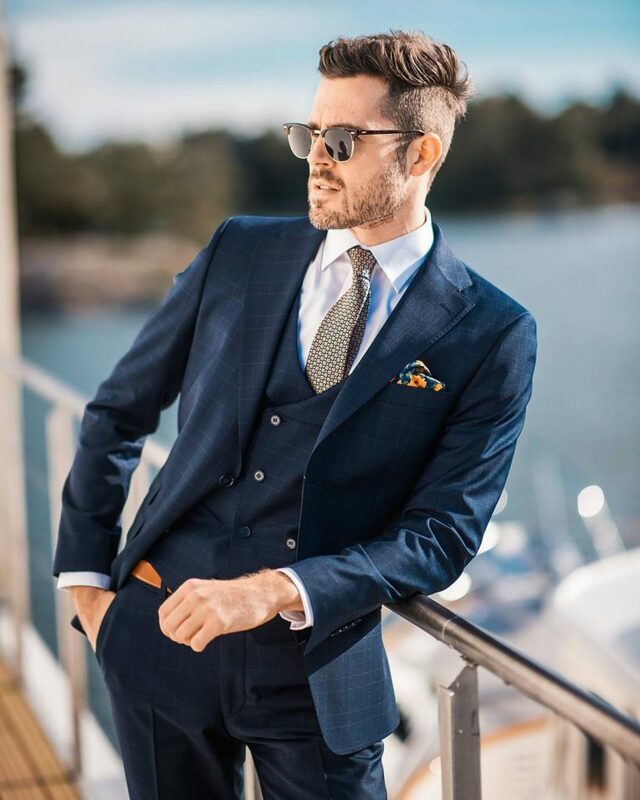 The old school look and classic fit of this suit are fantastic, and it also has a unique double breasted design that will make any man look refined. 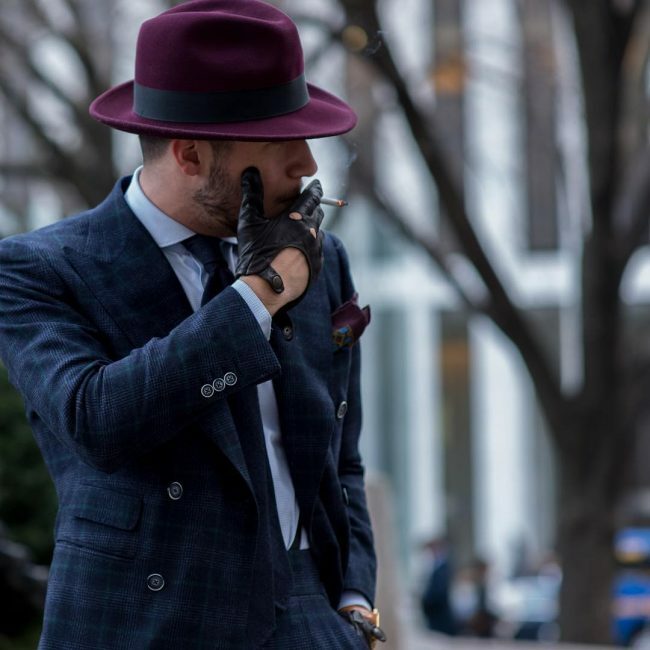 Apart from the old school look the wearer also pairs it well with a crisp burgundy hat and pocket square for a smart and classy finish. 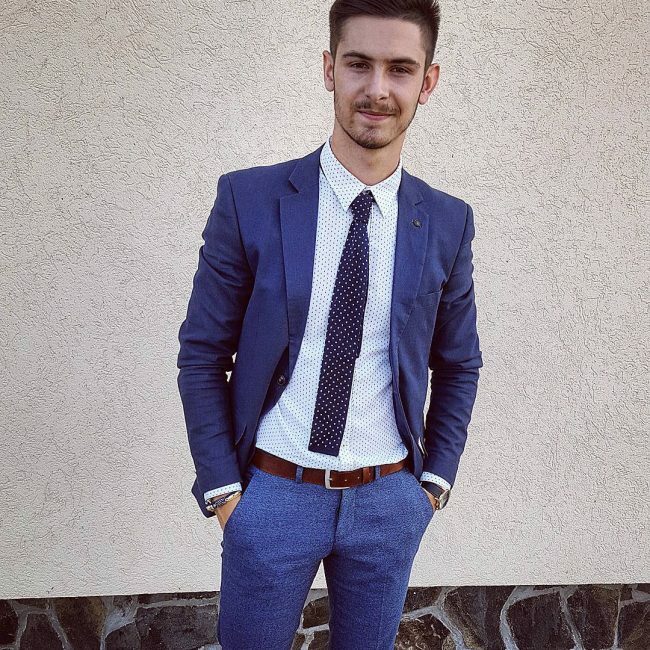 A slim fit navy blue suit goes well with some brown formal shoes. 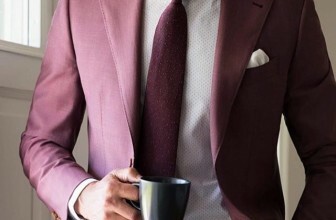 The wearer also pairs his lovely suit with a brown tie and an orange pocket square which is nice but a little odd for this look due to its color. 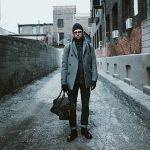 The slim fit might be in trend but some men still prefer to go for something that is not too boxy and constricting, and this is what makes the modern fit a perfect choice. 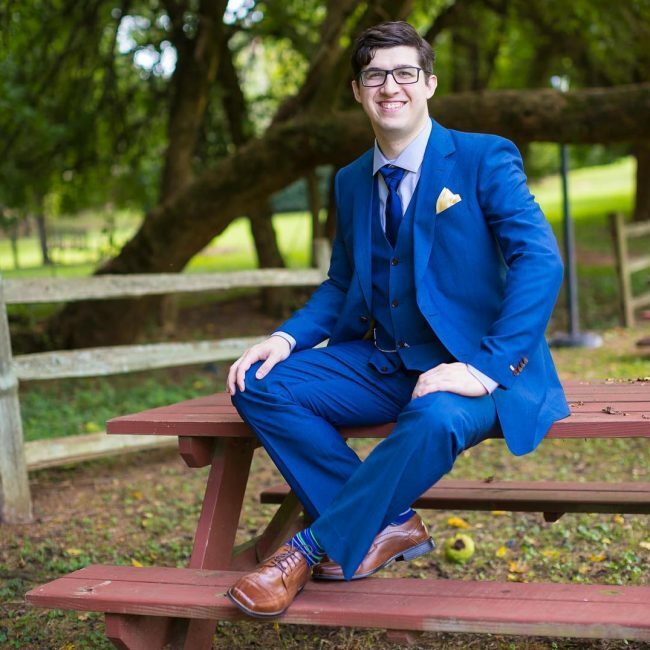 In this design, the perfect fit comes from the fact that the suit is custom made and the wearer pairs it with a light blue shirt, red tie, and black shoes. 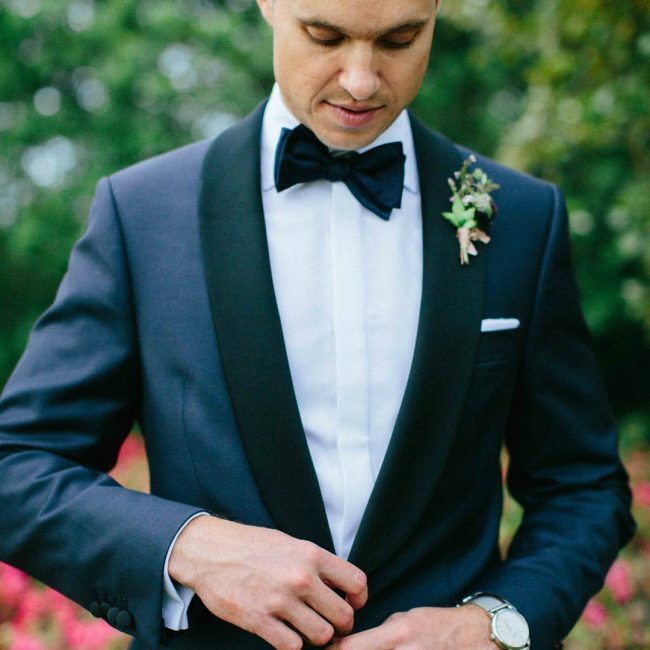 A shawl lapel suit is what you should go for if you want to rock a bowtie. 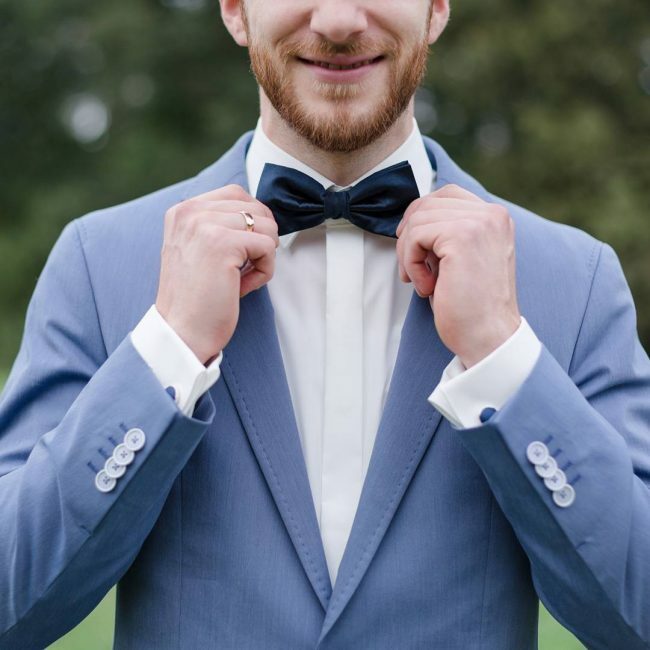 In this design, the slim fit suit has a one button design and it pairs well with the black bowtie and white shirt to create a perfect look for a wedding or dinner date. 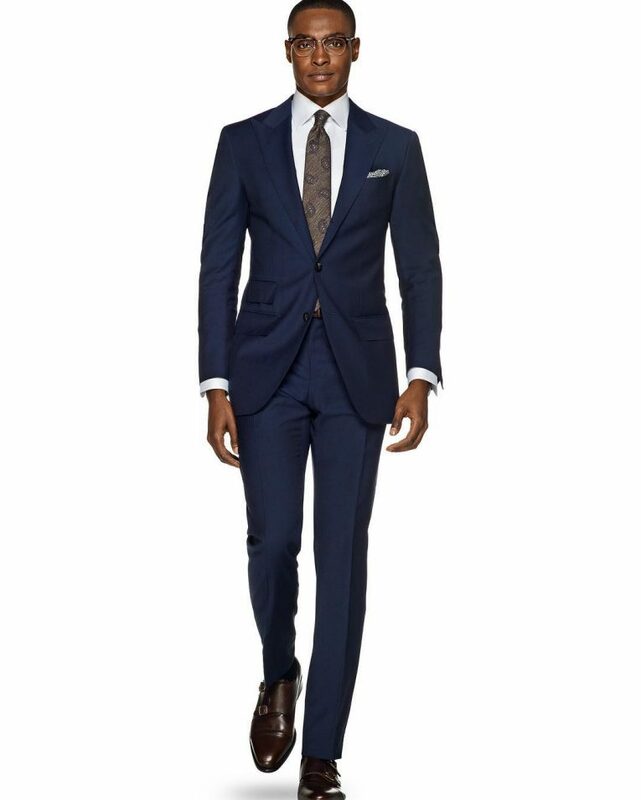 This lighter color comes to mind when you think of navy blue and it still makes a fantastic suit. 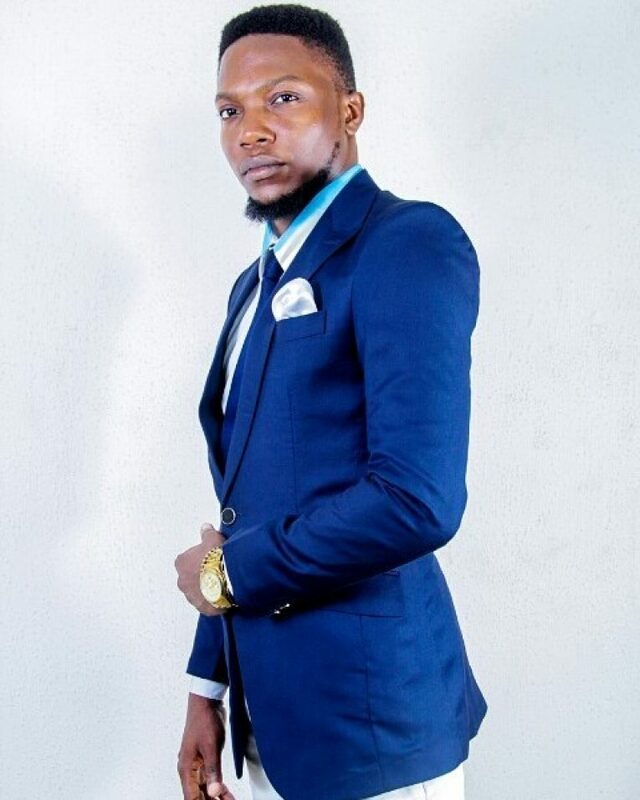 The suit is a slim fitting two piece with the vest having three buttons and notch lapel design and the wearer pairs it with white shirt. 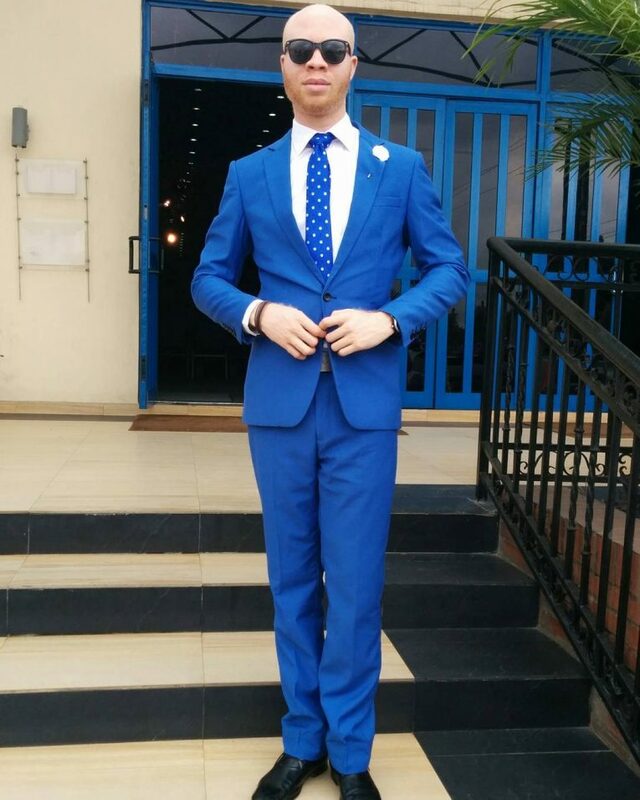 Blue suits do not get simpler than this but despite the simplicity the attire still makes the man look majestic. 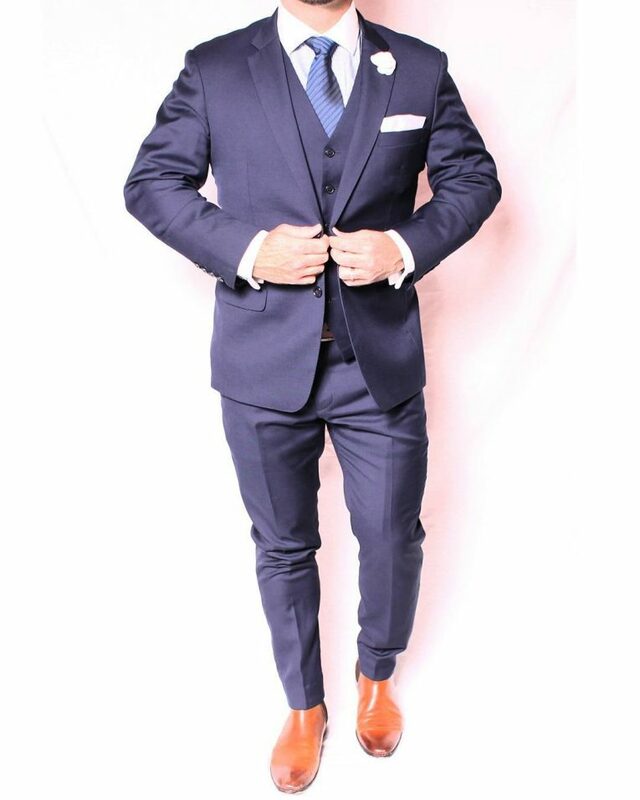 It is a slim fitting two-button suit that combines very well with brown formal shoes and a bright orange tie. 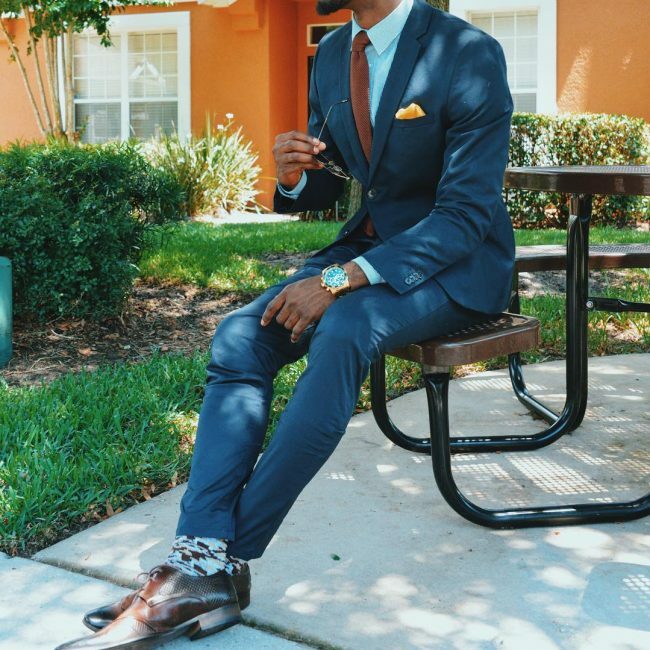 If you have been wondering how you can wear a suit with sneakers here is the perfect look for you. 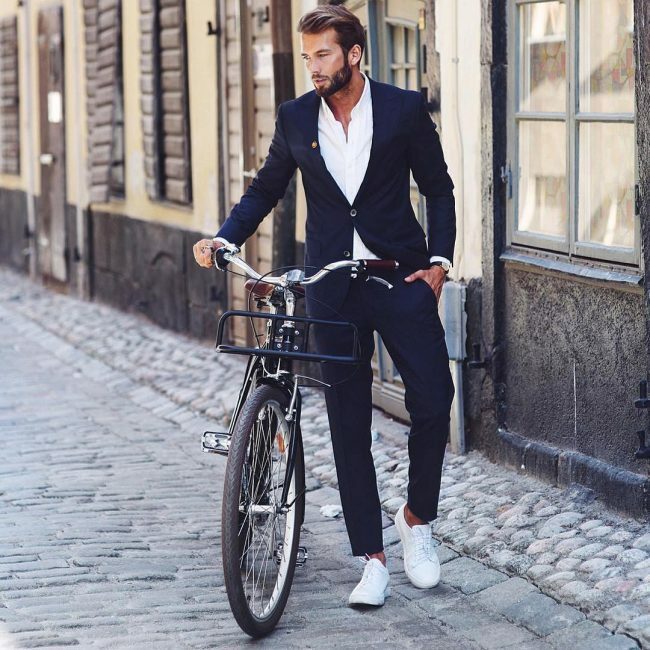 This two-button suit has an excellent fit, but the trouser seems a little short which is not a mistake but just a way of exposing the white sneakers and enhancing the relaxed appearance. 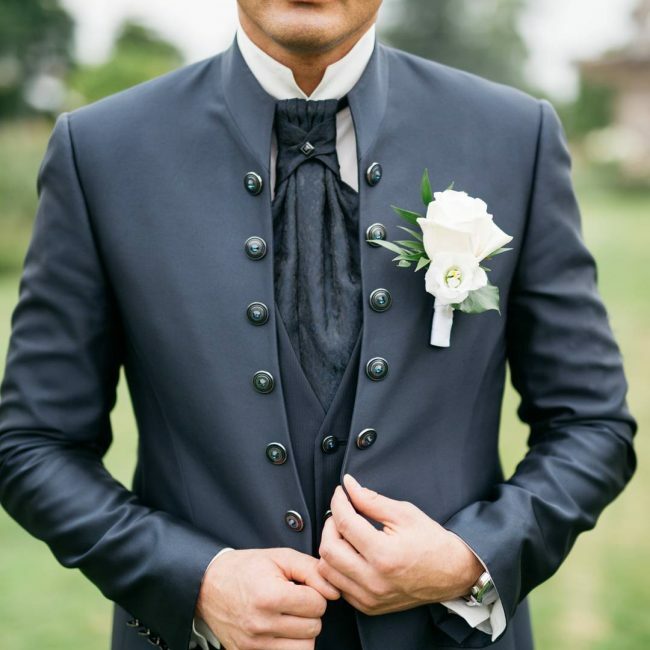 Three piece suits might be vintage designs, but this look gives them a unique and modern touch for a very classy finish. The vest coat has a double breasted design while the outer one is a single breast with two buttons. Apart from this, the man pairs it with a button down shirt and a neckerchief. Every gentleman that wants to look elegant and stand out from the crowd should always get inventive with his attire choice. 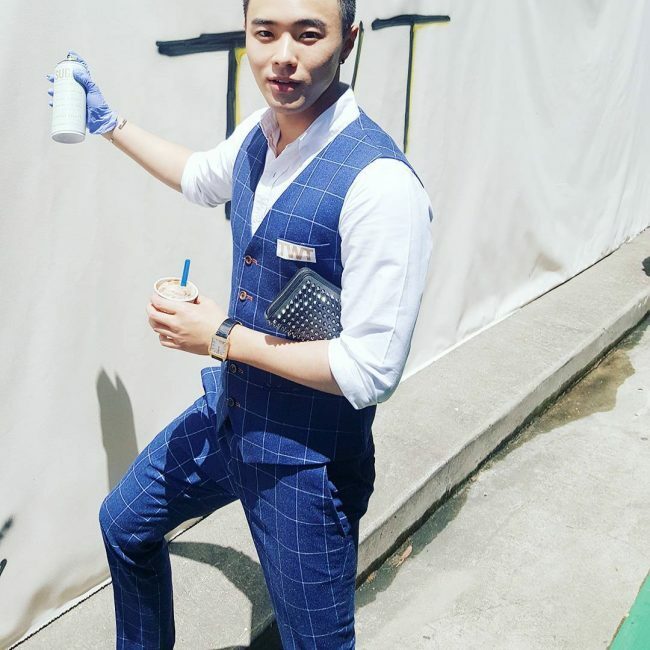 This style is an excellent example of creativity, and it involves wearing a broken three-piece suit that has a checked vest coat, navy blue full coat, cream pants and black tie on the light blue shirt. 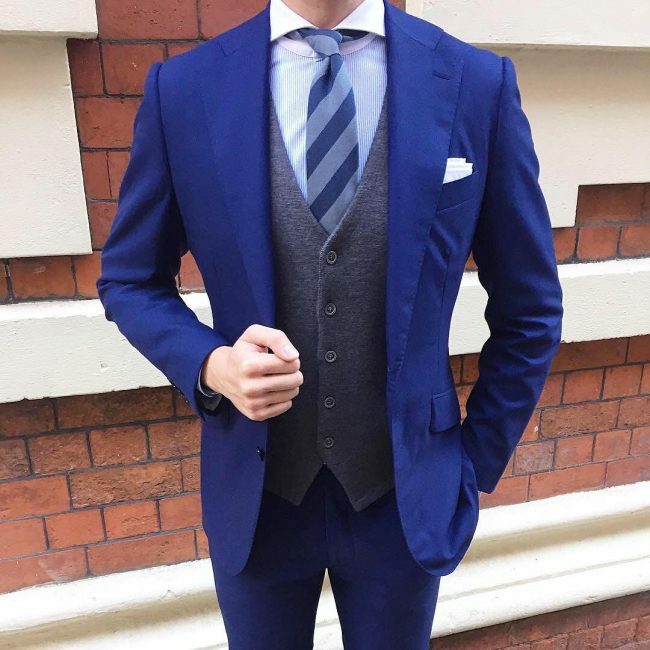 Peak lapels have a way of making any suit look classy, and this effect is one of the things that make this blue double breast suit look fantastic. The suit also has a slim fit, and it goes very well with the striped shirt and black patterned tie. 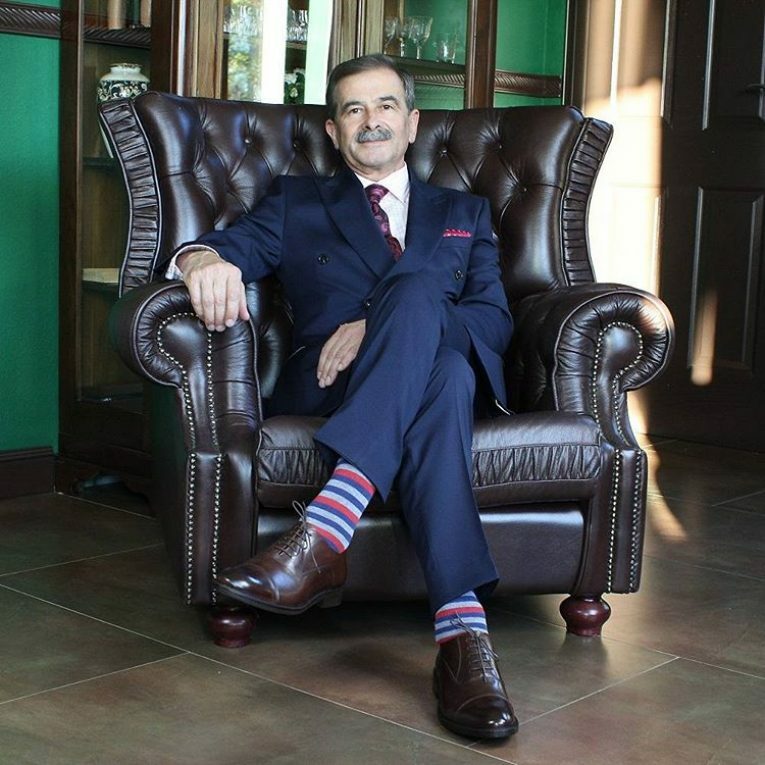 You do not have to wear a suit with a sophisticated design to look refined. 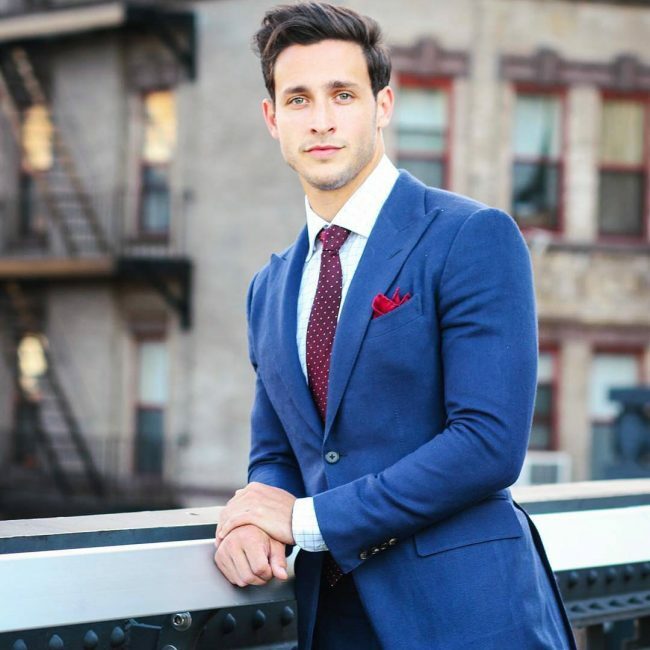 A simple navy one with two-buttons and a classic fit like this one is also head-turning, and you only need to pair it with a bright tie for a clean and neat finish. 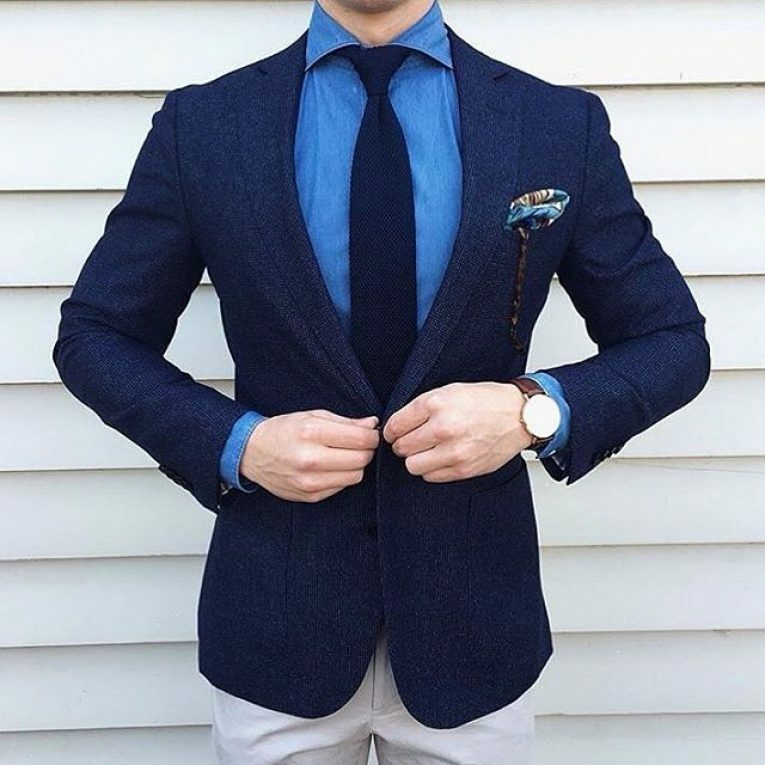 Navy blue has a way of brightening the appearance of any man, and in this style it makes the wearer look sharp and elegant. 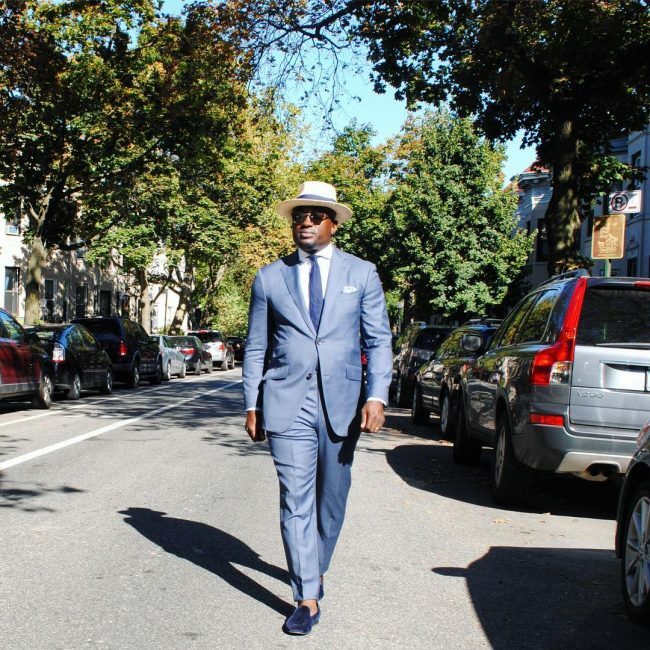 The suit is a three piece that pairs with a blue tie and brown shoes for a trendy appearance. One-button suits might not be as famous as those that have two buttons, but they still make adorable looks. 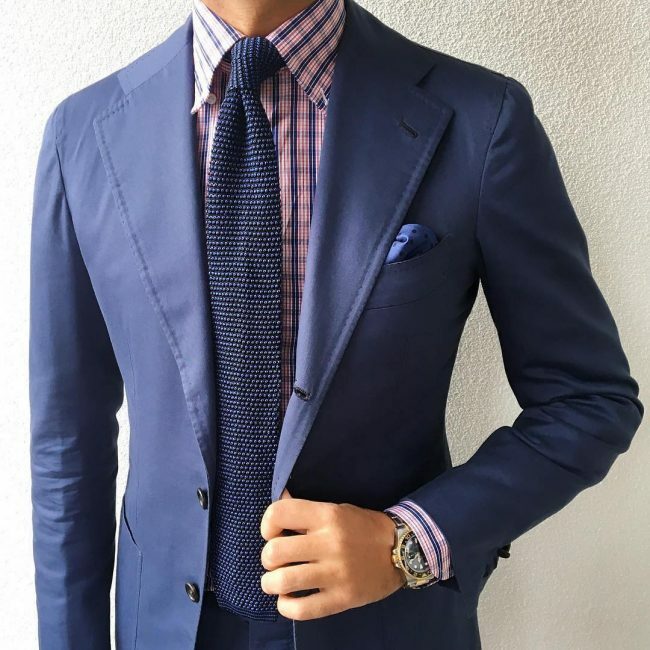 The one in this design has a beautiful navy blue color, and it pairs with a light blue shirt and pink pocket square to form a very attractive appearance. 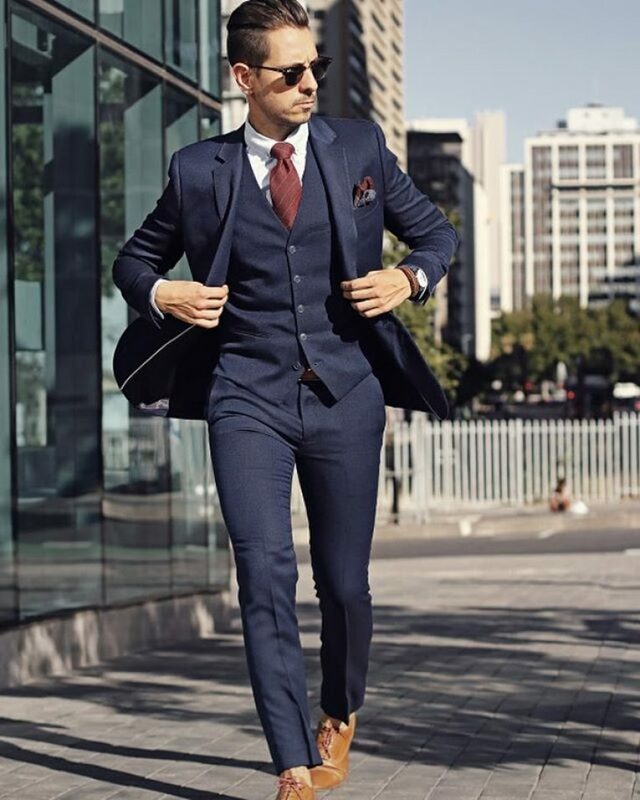 Although most men seem to prefer the slim fit suits, those that are loose and comfortable or with a classic fit like this one can still create a chic look. The man wears it with a white shirt and some brown dress shoes that make him look very stylish. 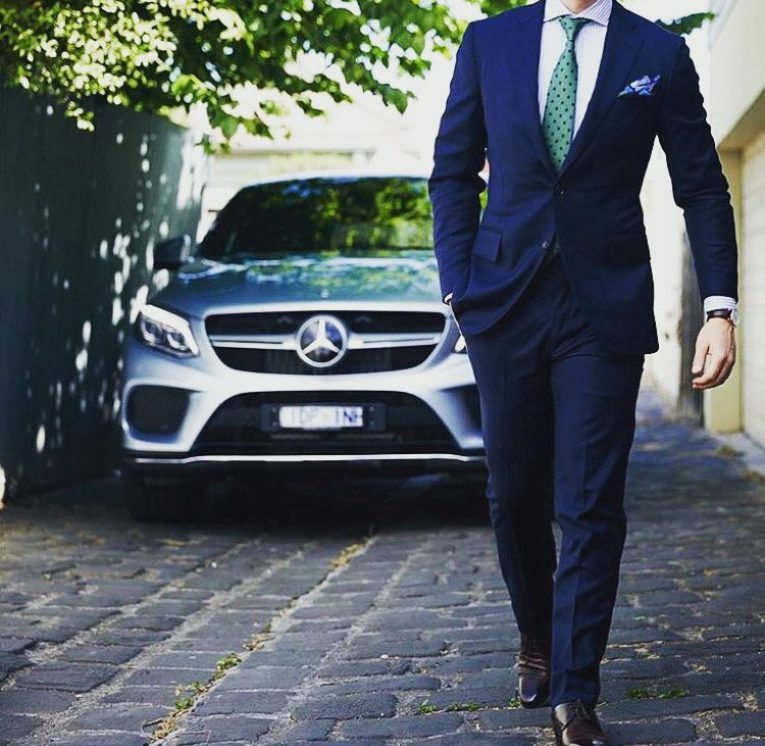 The type of suit that a man chooses to wear is one of the things that define his class. 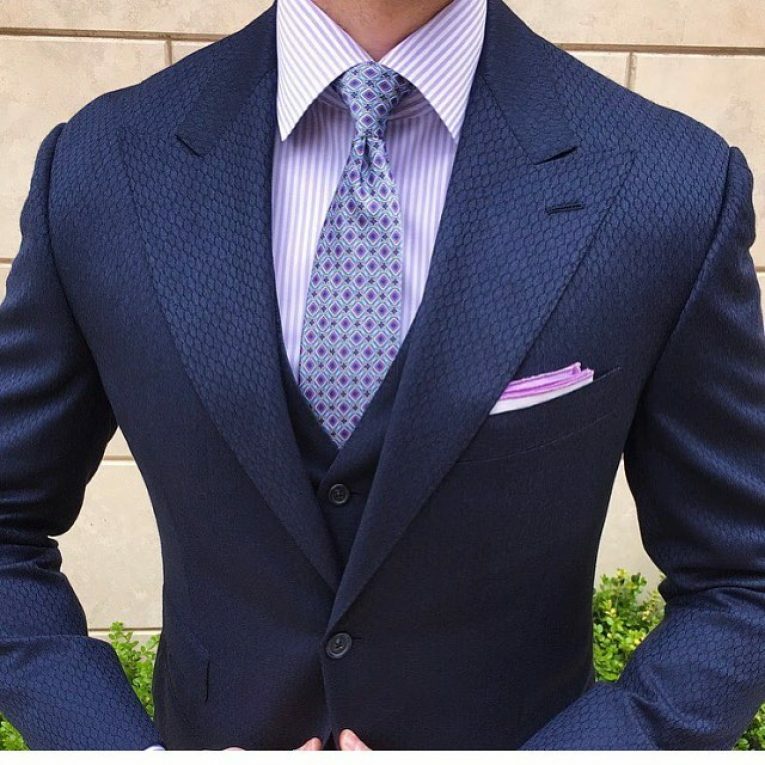 Those that want to look chic should try something like this which is a slim fitting navy blue suit that combines with a cheeky tie and checked shirt to create a polished appearance. 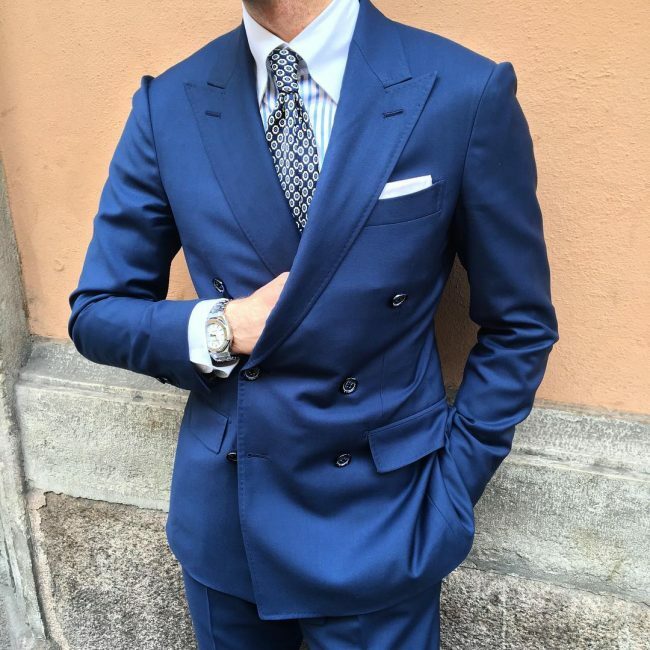 Italian suits are famous across the world due to their perfect fit and design. 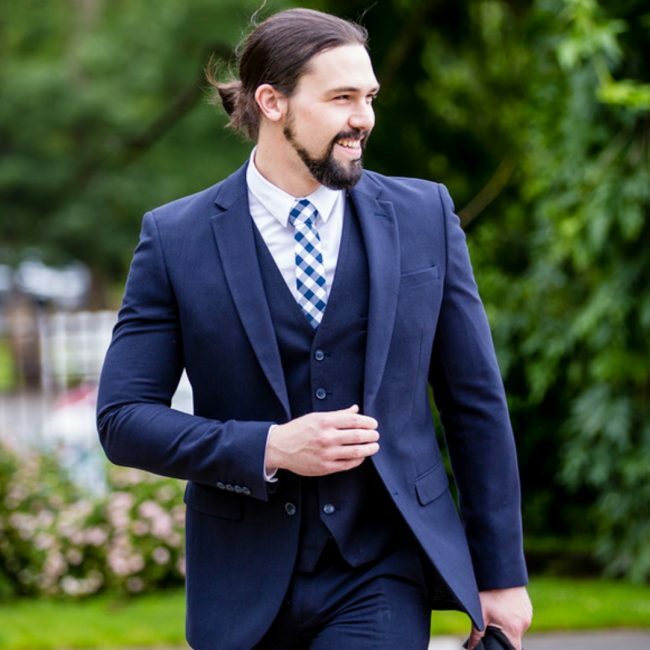 This particular one has these elements, and it also adds in a sweater vest coat to create a three-piece look and stripped shirt and tie for an elegant finish. 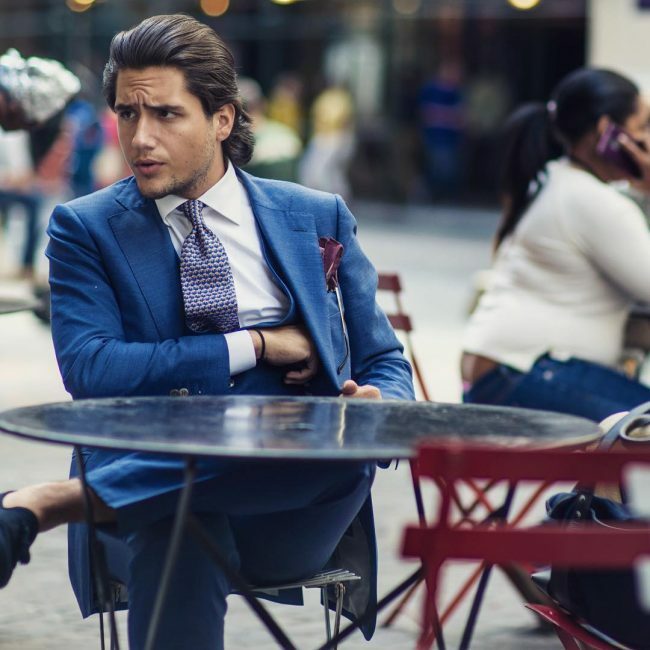 Suits are not just an office thing because you can still use them to pull a top notch casual look. 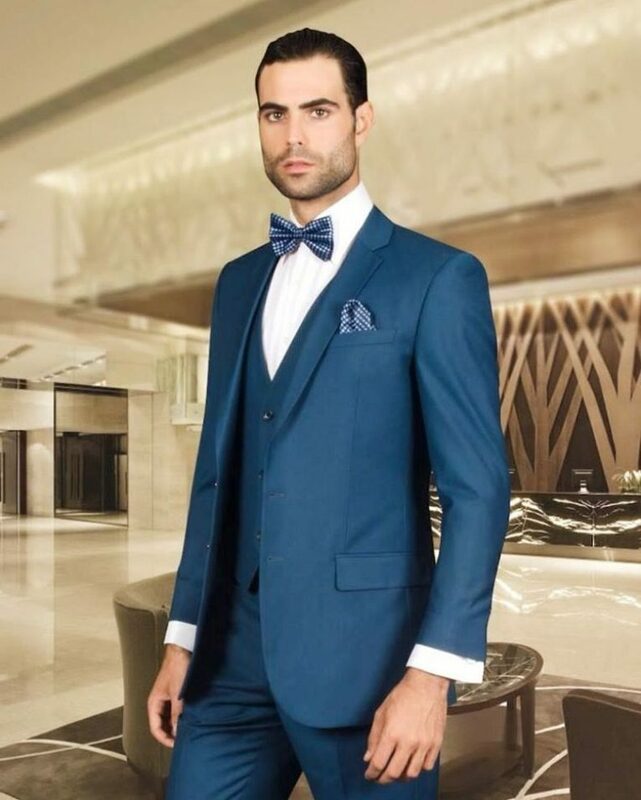 In this design, the blue suit has a modern fit, and you should pair it with casual leather shoes and a Panama hat for the perfect outdoor appearance. 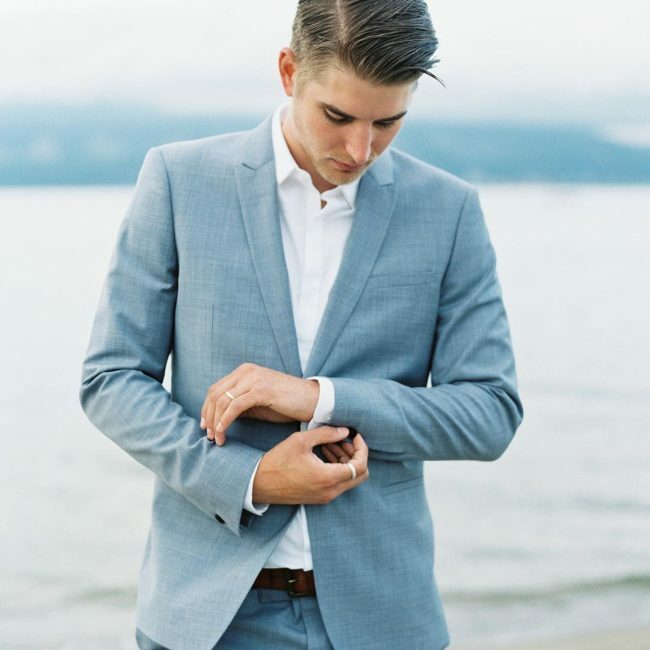 The fit on this suit is not just slim, but it conforms to the wearer’s body flawlessly. 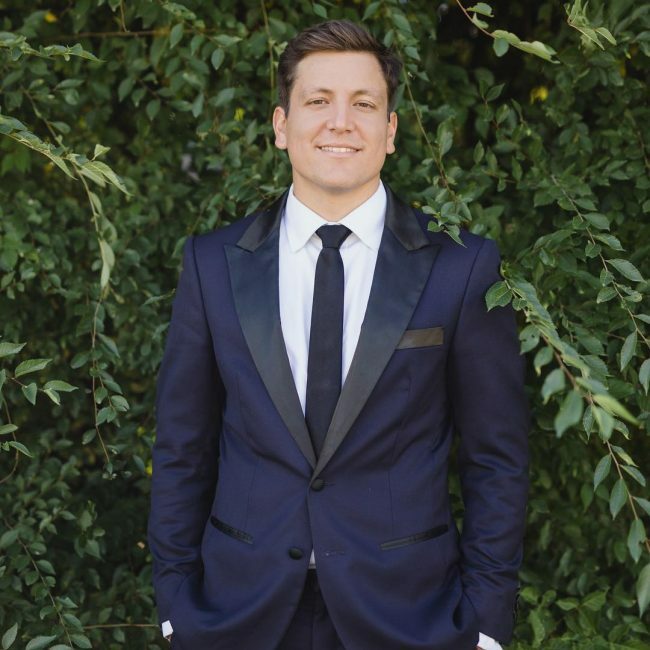 Although the color of the three-piece suit is amazing, the design and tailoring skills are top notch, and a silver tie on a white shirt are all a man needs for an elegant finish. 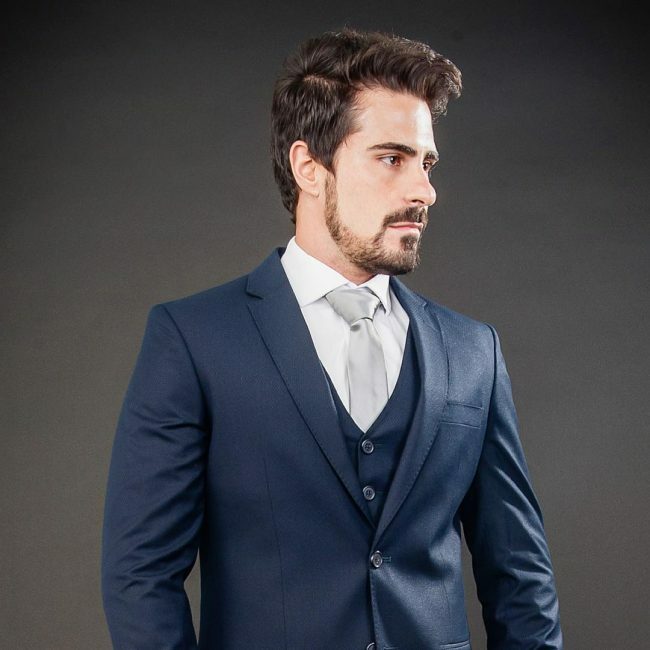 This navy blue suit maintains an overall dark look, and it has a modern fit that makes it very comfortable. 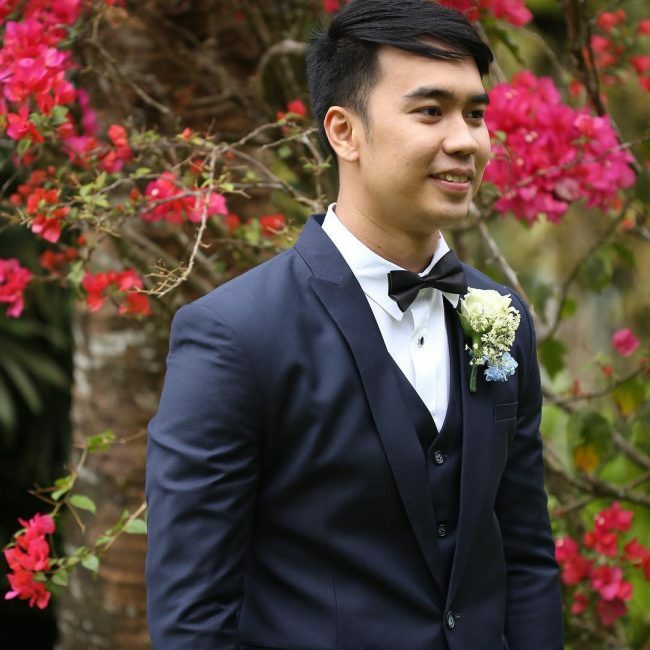 Although you can wear it with various shirt colors the white one and a black tie are perfect for a neat and well-groomed appearance. 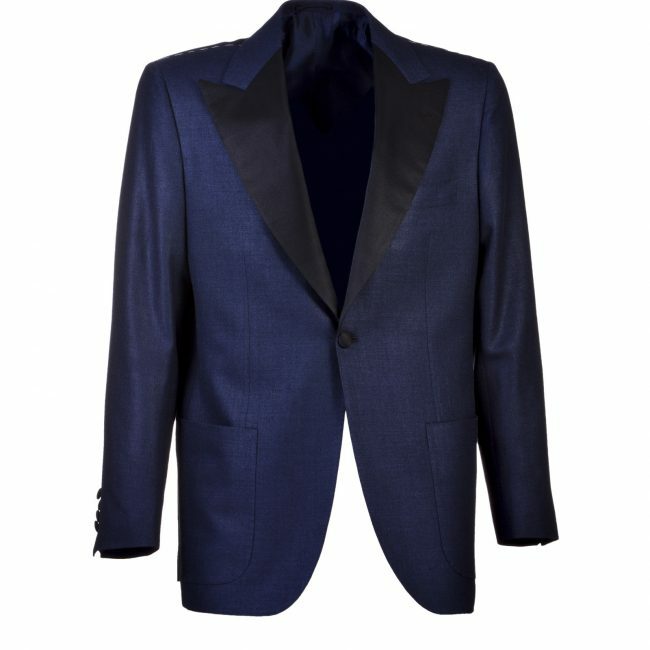 A navy blue suit will look elegant on any man provided he gets the design and fit right. This particular one also a beautiful shine and it goes well with a white shirt and a classic hat. 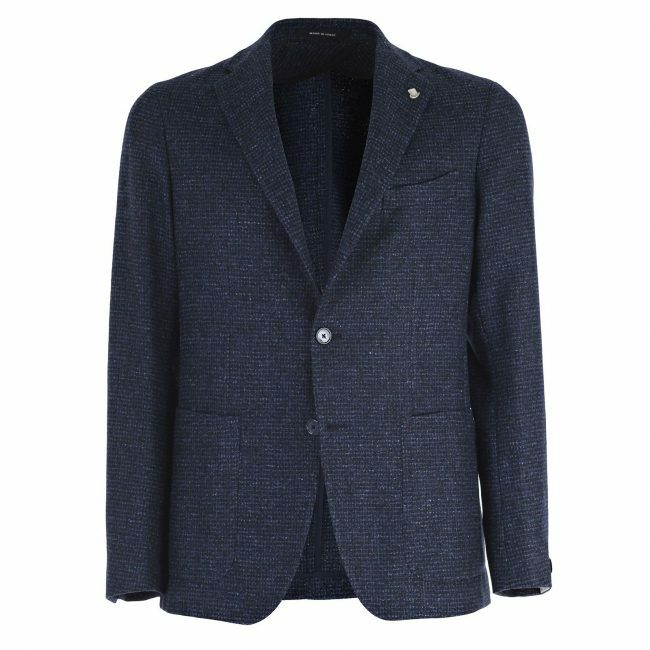 Although both the jacket and trousers in this design are blue, they have different shades of this color, and this creates a lovely and unstructured appearance. 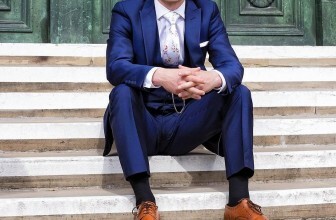 The dotted shirt and tie also look beautiful, and they add a distinct style to the look. A relaxed and casual design like this one will turn heads everywhere you go. 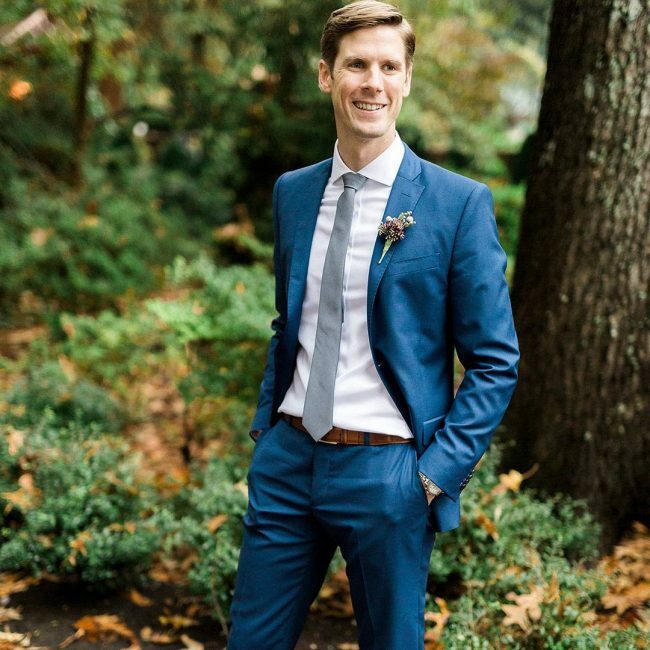 It is a slim fit blue suit that has a vintage turn up on the trousers, and you should wear it with a white button-down shirt and Nike sneakers. Here is an ideal gentleman look that you can pull almost effortlessly. 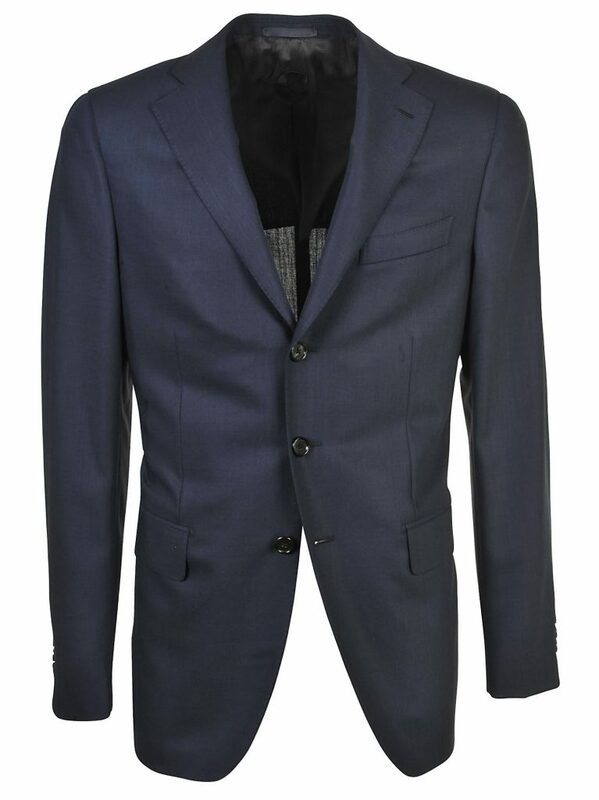 It requires a slim fitting three piece suit that you should wear with a blue checked tie and a white shirt. Sometimes trying out a new suite design is the way to go if you want an attention-grabbing look. 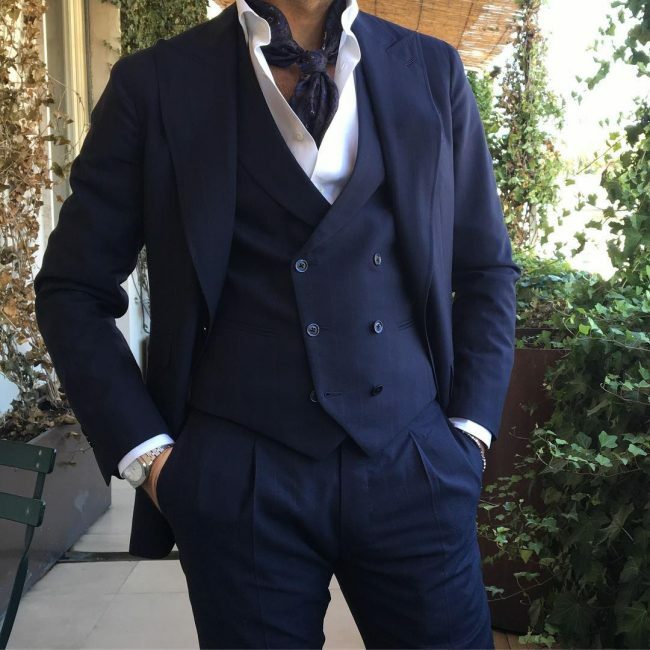 The three piece suit in this outfit has a custom design with Chinese collar style and a unique cravat that will make any man stand out from the crowd. 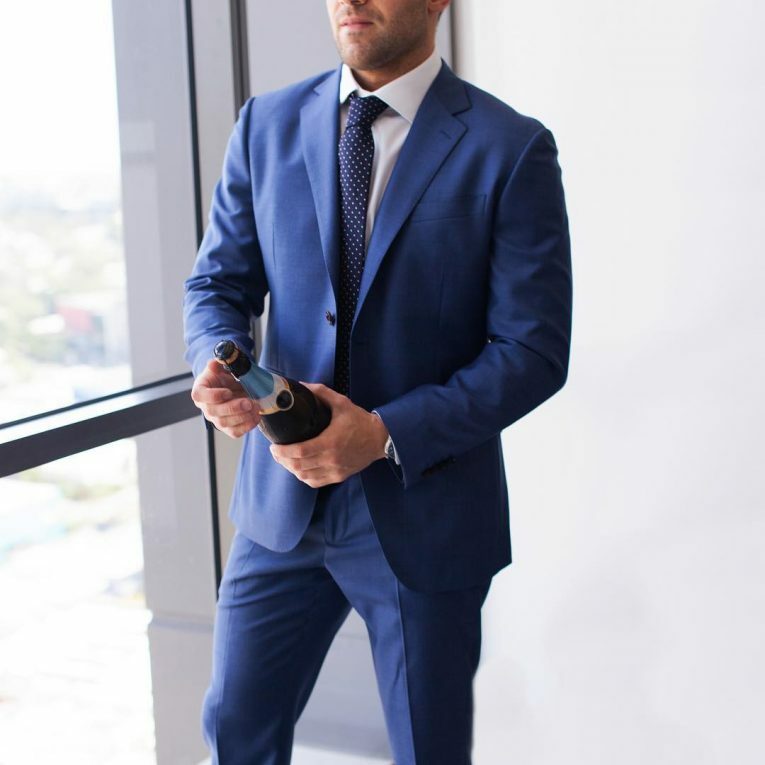 This suit has a lovely and light navy blue shade and a very impressive design that involves making it a slim fit and with one button on the coat instead of the common two like in most other suits. 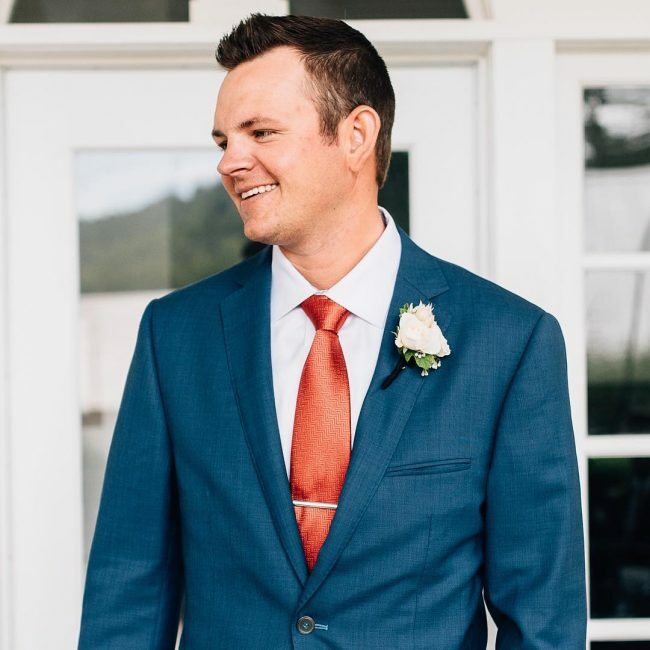 The nice two button suit in this look has a simple design and a perfect fit and it combines with the clean white shirt and a small bowtie to create an appealing overall appearance that is ideal for formal events such as weddings. 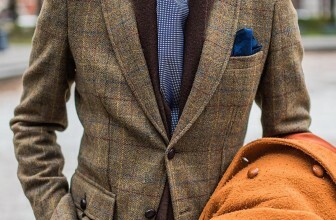 A suit like this one should inspire any man to wear a formal look as it is just perfect. 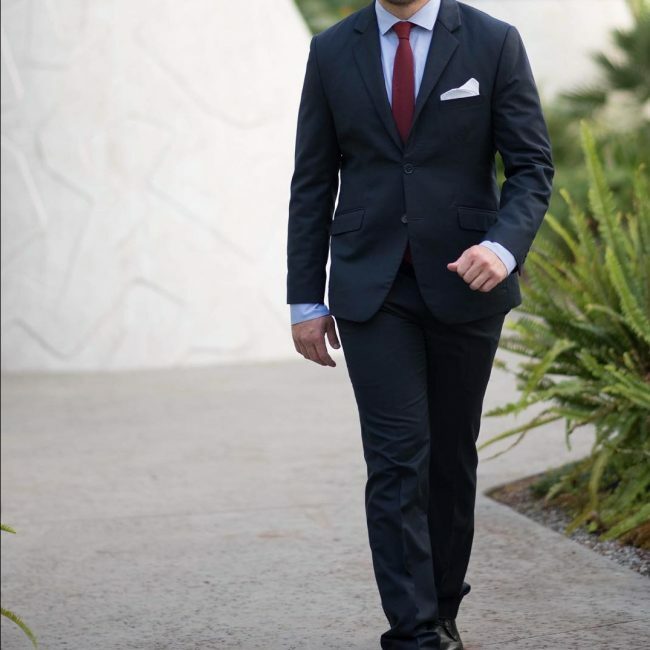 It is a slim fit with notch lapel and pocket square, and it looks fantastic with a gray tie and white shirt. 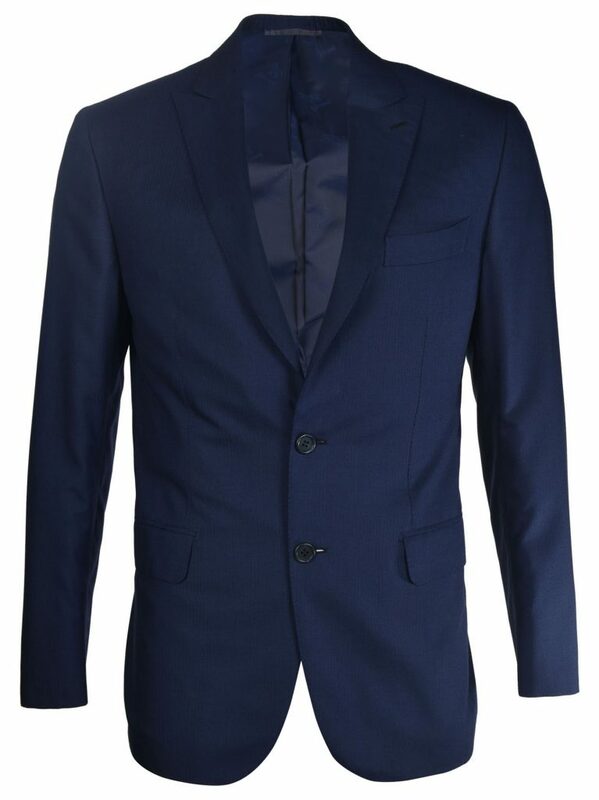 A navy blue suit will make any man look classy and elegant, but this is if he can have it with a nice fit and design. 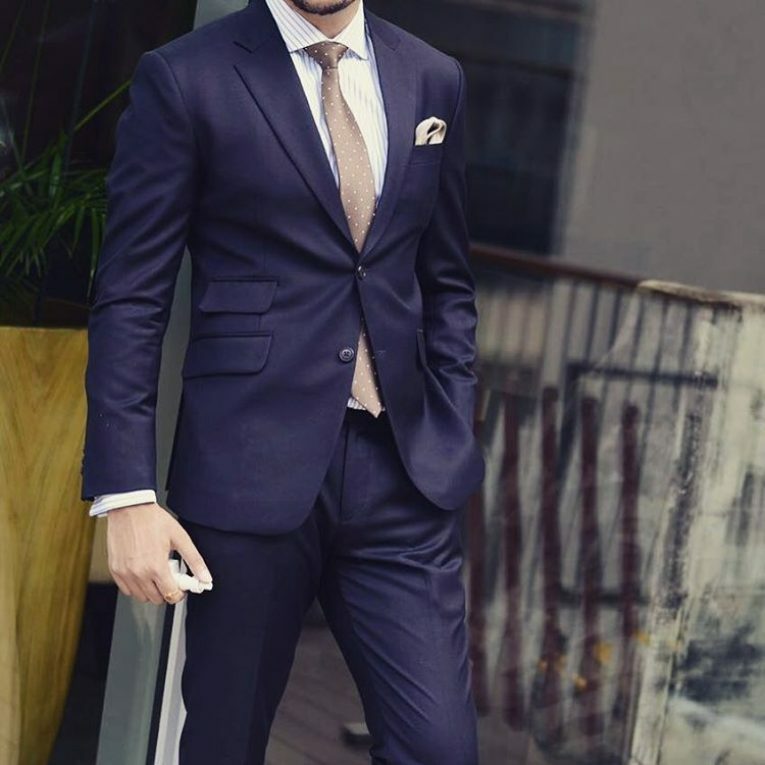 Whether you prefer business casual or formal look, this suit will work for you, and you only have to combine it with a stylish pair of shoes and shirt for a head-turning look.